Hello! I'm super excited to announce that I am now a fully permanent member of the Neat & Tangled Design team! I just love their cute designs, and was thrilled to be asked to stay on after my guest spot last month! I've combined several different stamp sets here to create this fun card! For the background I used watercolor paper and blended Distress inks in Crushed Olive, Mowed Lawn and Broken China. I speckled with water as well. 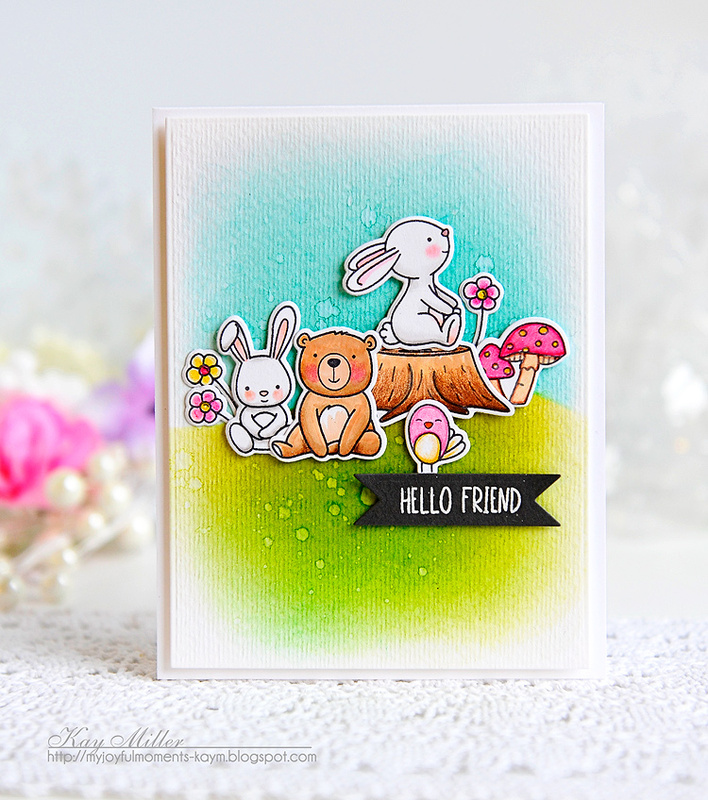 I stamped images from Lumberjack Love, Cottontail Cuties, and Into The Woods to create my cute little scene. All of the images were colored with Copic markers and Prismacolor Colored Pencils. I cut them out with the coordinating dies and added them with foam tape. Lastly I stamped the Hello Friend sentiment from the Scandinavian Prints Stamp set onto black card stock, and embossed it with white embossing powder. I cut that out with a banner from the Scalloped Dies set and added to the card with foam tape. I hope you have enjoyed seeing my card and that it will inspire you to mix and match some of the cute images in all of these stamp sets! Such a cute critter card. Love the colors. Congrats on being a new DT member. I'm so excited for you. I'm excited for myself, too. I get to see your Neat & Tangled projects. Congratulations Kay, you're a perfect match for this company!! This card is as sweet as can be. Love the little Spring scene you've created! Congratulations, Kay, you'll be a wonderful addition to the Neat & Tangled team! I totally adore this sweet card, Kay magic on a card! YAY! It's going to be so fun to see your creations with N & T! Congrats Kay! This card is so cute! I LOVE everything about it! Super cute bunny, bear and cheep coloring! Such a wonderful, happy card! Huge congrats on your new DT assignment, Kay! How exciting! 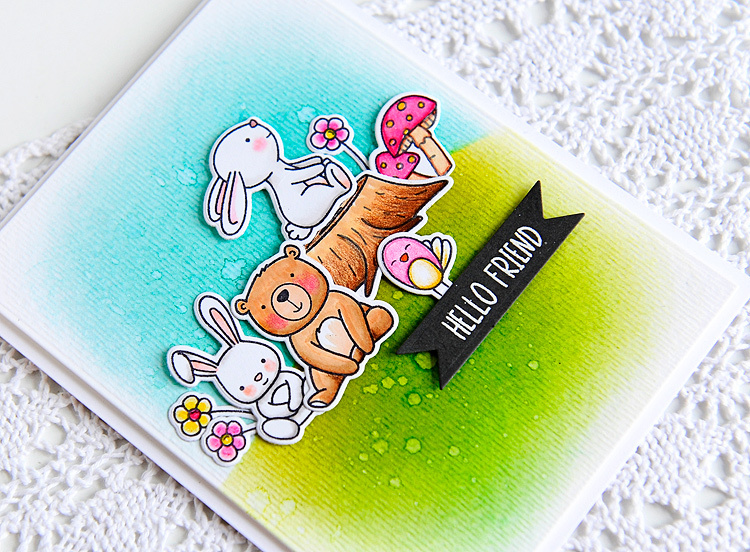 Your card is super cute with the darling critters! Lovely water coloring, too! What Design Team WOULDN'T want you on their side, Kay?? ;-) Huge congrats, and an amazing card to kickstart your time with Neat & Tangled. Congratulations Kay, this card is true Kay style and I love it!! I agree with Susi K, every design team should want you on their team, Kay! My stash has been widely influenced by your work. This is so fun, bright happy and a fab design! Yay! I am so happy for you and me- I get to see more of your work. LOVE this darling card with all of your beautiful coloring...So CUTE!!! Such an adorable Spring scene, Kay, with your style of ink blending and water spots. Congrats on your new DT assignment! Neat & Tangled is so very lucky to have you. So happy to see more creations from you again. Super happy for you, Kay, and for N&T to have you on board! Love your happy card--it shows your happiness, big time! Congratulations Kay!!! You deserve all the best! I can't think of a better match than you and Neat & Tangled. Yay and congratulations! P.S. Love this card so much. Kay congratulations on joining the Neat and Tangled Design Team! 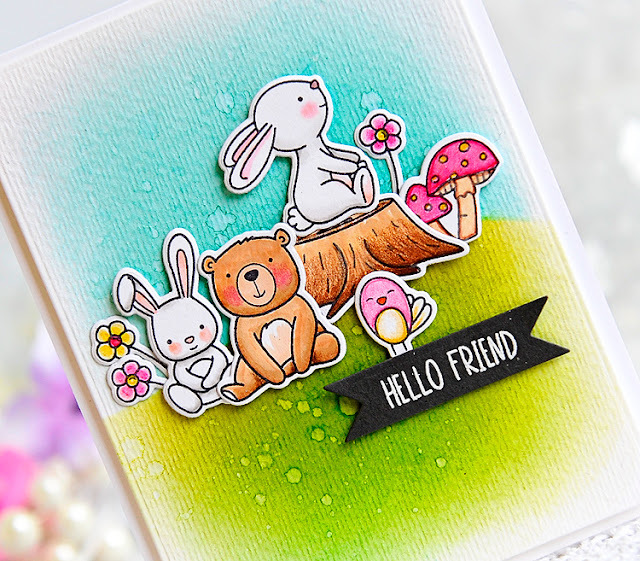 Your debut card is just fantastic I love the awesome Distress ink background and those sweet little critter images just make me smile!